If you are having problems with a clogged drain field, we have an effective and inexpensive soloution for you. Septic-Flow liquid shock treatment for clogged drain field helps to loosen the soil surrounding your drain field. There's no need to call an expensive repair man just yet! Clogged drain fields are common and most often, the issue can be resolved with the use of liquid shock being poured down the drain, toilet or distribution box and over the area that covers your drain field. Learn more about drain fields and treatment methods. 3-5 Gallons total per avg. 1000-1500 Gal Septic Tank. One Gallon Every 6 Months for Maintenance. Shock Treatment Use 2-4 gallons via toilet or via d-box. For septic drain fields NOT MOVING (toilets backing up and tank constantly fill) Application can also be done by poking holes above the drainfield lines with 8"-12" spaced every 2-3 feet apart and pouring product into each hole. read the entire label including all cautions. 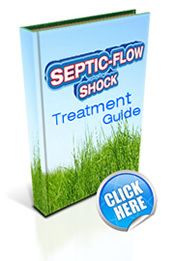 Septic-Flow is NOT an enzyme or bacteria. Enzymes and bacteria have a great place in a septic system but they do nothing to address sodium build-up in the drain-field soil. This build-up cause the soil to lock up and not accept drain-field water over time. Septic-Flow is not new science. It is a tried and true method to get your septic field flowing again. In simple terms it is a chemical product used since the 1950's to help soften or loosen the soil surrounding a clogged drain field system to get it flowing again. It helps reverse "deadpan" or "hard soil" that has formed after years of sodium building up in the soil from the use of washing machine and laundry detergents, body and hand soaps with thousands of gallons a year pouring into your septic field that slowly accumulates sodium build-up over time, causing the soil to harden and not accept any more water or bio-nutrients from your septic system into the soil. Once the soil locks up, there is little left to do but dig up the entire drain-field system and install a costly new one. Now you have a simple and inexpensive solution to digging up your entire septic system caused by locked-up soil. How Do I Use Septic-Flow for Clogged Drain Fields? Start with 3 gallons of product. Use 1-2 gallons of product via the toilet, sink or drain closest to the septic system outlet. Next After 1 week add another 1-2 gallons.. Flush freely with water to distribute it throughout the septic system drain field. Use 1 gallon every 6 months via the toilet or nearest drain closest to the septic tank. Start with 5 gallons of product. Apply minimum of 3-4 gallons of product directly to the drain field soil. Apply the final 1-2 gallons via the distribution box / cleanout or septic tank opening. For waterlogged systems, try to drain off as much excess water as possible before treatment. Use a hose and add 40-80 gallons of water to the distribution box with the product to ensure it makes it through the entire drain field system. If you can not access the distribution or "D-Box", it may be necessary to add additional product via the toilet or sink. The directions may need to be repeated for seriously slow or completely “locked” soil, especially clay type soils. Septic tanks can be hazardous as noxious gasses can form in the septic tank. Opening the tank may release these gasses, and precautions should be taken to ensure you do not breathe these gasses. If in doubt have a professional service your tank with our products. Many thanks Septic Flow you saved me $6,700!! I had some problems with my septic for a few years. Finally my drain field was starting to show mud in my front yard from the lack of proper septic drainage. I had several contractors come a look at it. They suggested a full replacement of the drain field pipes for $3,900. I decided to find something on the Internet and tried this product. It worked wonders in just a few weeks! Much appreciated! Rarely do I write a review but after having my septic tank pumped 3 times at the cost of $750 only to be told that my soil was "frozen up" and the entire septic field need to be replaced for $5,400 did I try your product. All I can say is that it was the best $299 I have ever spent. My drainfield is back to normal after just 2 treatments. Many thanks!! Click the button below to add the Septic-Flow Shock™ Liquid for Clogged Drain Field (4 Gallon Pack) to your wish list.